Contest: WIN: Rose Gold Reusable Straw Set! 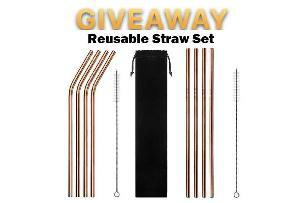 WIN: Rose Gold Reusable Straw Set! Prize: 10 piece rose gold set (8 straw & 2 brushes in a beautiful velvet bag). This set is dishwasher safe and made from stainless steel. Statistics: This contest was opened by 172 and entered by 21 ContestChest.com members. 12% of those who opened the contest, entered it.